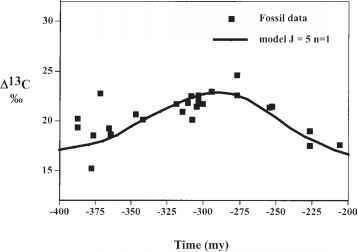 The isotope mass balance method for determining the values of Fbg, Fwg, Fbp, and Fwp is based on variations over Phanerozoic time in 13C/ 12C and 34S/32S of the oceans as recorded by the isotopic composition of CaCO3 and sulfate-containing minerals (mainly CaSO4) in sedimentary rocks (Veizer et al., 1999; Strauss, 1999). As discussed in chapter 3, changes in oceanic 13C/12C (figure 3.3), expressed as 813C, largely reflect changes in the burial flux of organic matter in sediments. Changes in oceanic 34S/32S largely reflect changes in the burial flux of pyrite in sediments because bacterial sulfate reduction to H2S (reaction 6.8) brings about the depletion of 34S in the resulting sedimentary pyrite. Removal of carbon as carbonates and sulfur as sulfates from seawater involves little isotope fractionation. Thus, increased burial of organic matter and pyrite results in greater removal of the lighter isotopes, causing the oceans to become enriched in 13C and 34S. There is little fractionation of carbon and sulfur isotopes during the weathering or thermal decomposition of organic matter, pyrite, carbonates, and sulfates. Thus, the isotopic composition of input to the oceans and atmosphere reflects the relative importance of the weathering and thermal decomposition of isotopically light sulfide and organic C versus that of isotopically heavy carbonate and sulfate. Figure 6.3. 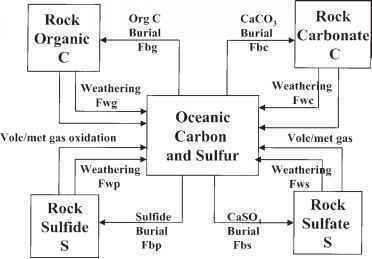 Isotope mass balance model for the carbon and sulfur cycles as they affect atmospheric oxygen. morphism, and diagenesis Fbs = burial flux of Ca sulfates in sediments Fbp = burial flux of pyrite in sediments 5 = [(34S/32S)/(34S/32S)stnd - 1] 1000. It is assumed that the value of 8bs is the same as Ss for seawater and that the difference between Sbs and Sbp, representing the fractionation of sulfur isotope during bacterial sulfate reduction, is constant or varies with time. The various fluxes based on the use of expressions analogous to equations (1.10), (1.11), (6.16), and (6.17) have been calculated by a number of workers (Holland, 1978; Veizer et al., 1980; Berner and Raiswell, 1983; Garrels and Lerman, 1984; Francois and Gerard, 1986; Kump and Garrels, 1986; Walker, 1986; Berner, 1987, 2001; Kump, 1989; Lasaga, 1989; Carpenter and Lohmann, 1997; Petsch and Berner, 1998; Bergman et al., 2003; Hansen and Wallmann, 2003; Mackenzie et al., 2003). However, most of these studies have focused on only one element, either carbon or sulfur, and not on the evolution of atmospheric O2. In fact, some studies (e.g., Garrels and Lerman, 1984), have assumed constant O2. In all cases the isotope mass balance modeling is guided by the isotopic composition of seawater as recorded by carbonates or sulfates in sedimentary rocks. The change in seawater isotopic composition with time represents the balance between input fluxes of 13C or 34S from weathering and thermal degassing and outputs via burial in sediments. Calculations were performed in two ways. The first method starts with assumed initial values and readjusts them until correct present-day values are obtained at t = 0. The other method starts with present-day values and then calculates the fluxes backwards in time. In the modeling studies cited above, except for the recent ones of Hansen and Wallmann (2003), Bergman et al. (2003), and Mackenzie et al. (2003), weathering and thermal degassing are lumped together as "weathering," and total crustal carbon and sulfur are assumed to be conserved. Also, the pre-2003 studies assume that the various (f) factors discussed throughout this book are equal to 1. This means that weathering rate is simply proportional to the mass of each reservoir shown in figure 6.3. For further simplification, in a number of studies (e.g., Berner, 2001) steady state is assumed so that dMc/dt, dMs/dt, d(8cMc)/dt and d(8sMs)/dt are all set equal to 0. For carbon this assumption is very reasonable (e.g., see chapter 1), and inequalities between weathering and burial of organic matter result in reciprocal inequalities between weathering and burial of CaCO3. Total sulfur is also conserved by reciprocal behavior of pyrite and CaSO4, but this is less justifiable than in the case of carbon because a modest portion of total sulfur can be stored as dissolved sulfate in the oceans. Any large difference in the net flux between oxidized and reduced reservoirs of carbon or sulfur cannot be maintained over millions of years, or fluctuations in atmospheric O2 would occur that are either physically impossible (negative masses) or so high that they are incompatible with the persistence of life on earth. One way to eliminate such impermissible fluctuations is to have any imbalances in the carbon cycle closely balanced by corresponding imbalances in the sulfur cycle (Lasaga, 1989). This would be reflected by inverse plots of S13C and 834S versus time, a situation that is approximated by existing isotopic data (Veizer et al., 1980). However, use of actual carbon and sulfur isotopic data does not remove this problem. The simple mass balance models, when applied to both C and S isotopic data, result in excessive fluctuations in O2 because of the great sensitivity of O2 to the isotopic data (Berner, 1987; Lasaga, 1989; Berner, 2001). The only way that excessive variations of O2 can be avoided when modeling both carbon and sulfur isotopes is to introduce negative feedback. One way to do this is to have pyrite and organic matter weathering rate increase with increasing atmospheric O2. However, as pointed out in chapter 3, studies of present-day organic matter weathering have not verified this assumption. It is commonly believed (e.g., Holland, 1978; Berner, 2001) that the rate-limiting step is exposure of organic matter to the atmosphere by physical erosion and not the reaction of the organic matter with O2. In addition, use of a direct proportionality between the rate of organic weathering and O2 concentration does not remove excessive O2 variation but, in fact, introduces new destabilizing positive feedback (Lasaga, 1989). To remedy the problem of excessive O2 variation, two mechanisms that provide negative feedback, but that are not normally considered as feedback processes, have been used. These are rapid recycling, as applied to rock abundance modeling discussed above, and O2-dependent carbon and sulfur isotope fractionation (Berner, 2001). Rapid recycling alone results in some reduction of the excessive fluctuations, but there are still physically impossible values for O2 (figure 6.4). 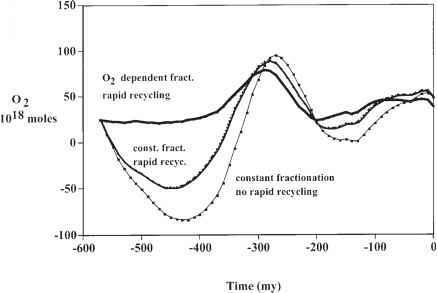 In contrast, oxygen-dependent isotope fractionation for carbon and sulfur, when added to rapid recycling, does result in reasonable values of O2 over time (figure 6.4). Figure 6.4. Plots of the mass of atmospheric O2 versus time calculated via C and S isotope mass balance modeling. Realistic values of O2 mass are obtained if both rapid recycling and O2-dependent isotope fractionation are included in the modeling. photosynthetic theory (Beerling et al., 2002). Also, O2-dependent fractionation calculated from modeling agrees with measurements of the difference in 813C between coexisting organic matter and carbonates over most of the Phanerozoic (Hayes et al., 1999; Berner, 2001). (Further discussion of plants and O2-dependent carbon isotope fractionation is presented later in this chapter.) For sulfur it is reasonable to assume that 34S/32S fraction-ation during pyrite formation should also be a function of O2. There is increased fractionation of sulfur isotopes between seawater sulfate and pyrite sulfur when, during the process of pyrite formation at shallow sediment depths, there is reoxidation of sulfur due to bioturbation (Canfield and Teske, 1996). With higher atmospheric O2, one would expect greater oxidation of sulfide accompanying the addition of dissolved O2 into sulfide-rich sediments by the bioturbating organisms. 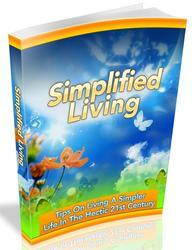 Learning About Simplified Living Can Have Amazing Benefits For Your Life And Success. Tips On Living A Simpler Life In The Hectic 21st Century. How to calculate isotope mass balance? How pyrite changes over time? What is the difference between 32s and 34s chemistry? What is the isotope mass balance method? What is the difference of 35s and 32s isotope?